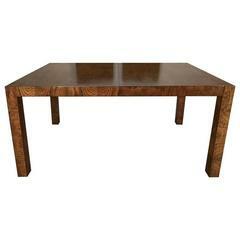 Burled elmwood dining table by Founders furniture for Thomasville, circa 1975. 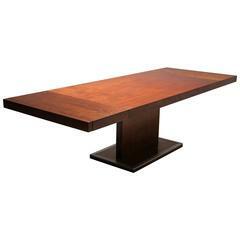 Includes two leaves, full table pads, and protective leaf storage covers. Each leaf measures 16.25" wide. 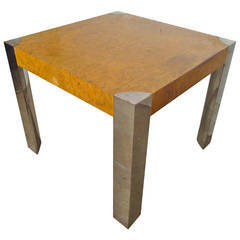 Table measures 68" long, or 100.5" long with leaves inserted. Very good condition with only very minor signs of age appropriate wear. 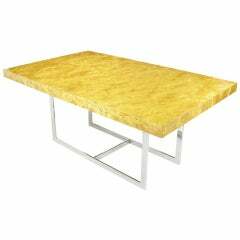 A contemporary burl wood and chrome dining table in the manner of Milo Baughman. 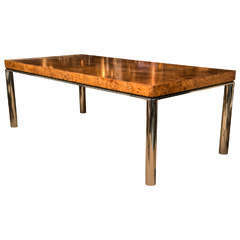 Clean lined burl wood dining table, designed by Milo Baughman for Thayer Coggin, American, circa 1960s. With it's two leaves installed, the tables measures 78" in length.